Goulburn is a regional city in the Southern Tablelands of New South Wales, Australia approximately 195km south-west of Sydney, Australia, and 90km north-east of Canberra. Kick off your visit on the 22nd (Mon): get engrossed in the history at Goulburn Historic Waterworks Museum, examine the collection at Riversdale Historic Homestead, and then see the interesting displays at St Clair Villa Museum and Archive. For reviews, where to stay, more things to do, and more tourist information, use the Goulburn holiday planning app . Sydney to Goulburn is an approximately 2.5-hour car ride. Plan for slightly colder nights when traveling from Sydney in April since evenings lows in Goulburn dip to 14°C. Wrap up your sightseeing on the 22nd (Mon) to allow time to travel to Cootamundra. Cootamundra is a town in the South West Slopes region of New South Wales, Australia and within the Riverina. Start off your visit on the 23rd (Tue): examine the collection at Cootamundra Heritage Centre, then see the interesting displays at Sir Donald Bradman Birthplace Museum, and then make a trip to Cricket Captains Walk. For reviews, photos, other places to visit, and other tourist information, go to the Cootamundra holiday website . Drive from Goulburn to Cootamundra in 2 hours. Traveling from Goulburn in April, you can expect nighttime temperatures to be slightly colder in Cootamundra, with lows of 11°C. Wrap up your sightseeing on the 23rd (Tue) early enough to travel to Clare. The town of Clare is located in South Australia in the Mid North region, 136 km north of Adelaide. On the 24th (Wed), hike along Riesling Trail, do a tasting at Shut the Gate Wines, learn about winemaking at Greg Cooley Wines, then do a tasting at Sevenhill Cellars, and finally learn about winemaking at Kilikanoon Winery. For photos, other places to visit, and other tourist information, refer to the Clare online trip builder . Explore your travel options from Cootamundra to Clare with the Route module. Finish your sightseeing early on the 24th (Wed) so you can drive to Tanunda. Start off your visit on the 25th (Thu): do a tasting at Chateau Tanunda, learn about winemaking at Rockford Winery, then learn about winemaking at Murray Street Vineyards, and finally do a tasting at Two Hands Wines Cellar Door. To find photos, reviews, ratings, and other tourist information, go to the Tanunda trip maker . You can drive from Clare to Tanunda in 1.5 hours. April in Tanunda sees daily highs of 26°C and lows of 13°C at night. Finish your sightseeing early on the 25th (Thu) so you can drive to McLaren Vale. McLaren Vale is a small rural town in South Australia famous for producing world class red wine. Start off your visit on the 26th (Fri): do a tasting at Fox Creek Wines, kick back and relax at Aldinga Beach, then do a tasting at Wirra Wirra Vineyards, and finally do a tasting at Primo Estate. 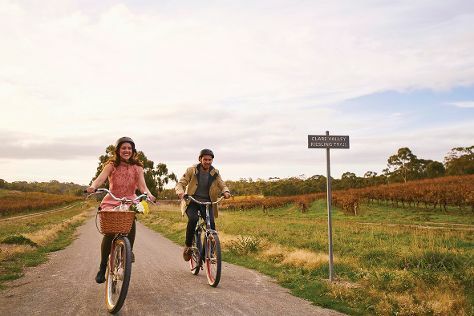 To find ratings, other places to visit, traveler tips, and other tourist information, you can read our McLaren Vale route planner. Traveling by car from Tanunda to McLaren Vale takes 2 hours. Alternatively, you can do a combination of bus and train; or take a bus. In April in McLaren Vale, expect temperatures between 26°C during the day and 13°C at night. Finish up your sightseeing early on the 26th (Fri) so you can travel to Kangaroo Island. On the 27th (Sat), brush up on your knowledge of spirits at Kangaroo Island Spirits, look for all kinds of wild species at Paul's Place Wildlife Sanctuary, and then enjoy the sand and surf at Stokes Beach. On the 28th (Sun), you'll have a packed day of sightseeing: Head underground at Kelly Hill Caves and then identify plant and animal life at Hanson Bay Wildlife Sanctuary. For more things to do, other places to visit, ratings, and more tourist information, go to the Kangaroo Island trip itinerary builder . Traveling by combination of car and ferry from McLaren Vale to Kangaroo Island takes 3 hours. Alternatively, you can do a combination of taxi, ferry, and bus. Finish up your sightseeing early on the 28th (Sun) so you can travel back home.